We believe that the quality, sustainability and durability of fiber cement siding is unmatched. And we chose to become part of the James Hardie Contractor Alliance Program Member and a James Hardie Elite Preferred Contractor because Hardie Siding is simply the best fiber cement siding. That being said, there is no one-size-fits-all solution and choosing the right siding for your home is a decision you’ll live with for a long time. So get all the facts. 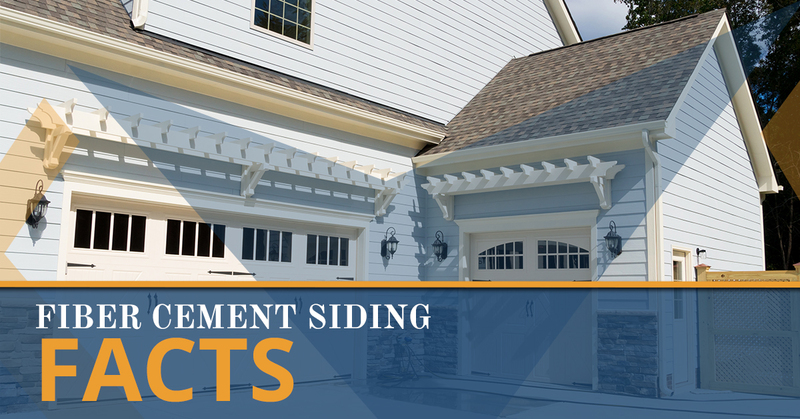 Here are some facts about fiber cement siding to help you with your decision making process. These facts all pertain specifically to the James Hardie Siding we offer, so you can rest assured that when you work with Golden West Exteriors you are getting only the best fiber cement siding. You really can’t get much more environmentally friendly. Hardie Siding is committed to a zero landfill project goal and is currently closing in on reducing landfill waste by half. They recycle the water used in manufacturing four times, and a minimum of 75 percent of raw materials are locally sourced. Vinyl siding takes almost twice the amount of electricity to produce, causing greater carbon dioxide emissions. It also releases PCBs into the air throughout its lifecycle. Portland cement, cellulose pulp, water and sand, the raw materials in fiber cement siding, are sustainable resources with very low toxicity. And thanks to the durability of these materials, fewer resources are used in maintenance and repair. Fiber cement siding is often used in new construction projects that are seeking LEED certification, the gold standard in green construction. Builders seeking LEED credit for their use of recycled content, use of regional materials, materials that require no additional finishing, and naturally pest-resistant building products, often choose James Hardie Fiber Cement Siding. As with many things, environmental-friendliness comes with additional cost. Fiber cement siding is no exception. It will cost a little more to purchase and install than vinyl. But, in the long run, most homeowners see a significant cost savings. Fiber cement remains, however, a more cost-effective option when compared to cedar or natural stone. Unlike vinyl siding, which is a good choice for many homeowners, fiber-cement siding is hard and extremely impact resistant. You can expect it to last 50 years or longer. It is also fire resistant. This has become a great selling point over the past few years as wildfires in urban and rural areas have become much more common. It will need to be painted during its lifespan. But because it takes in a lot of paint and holds it very well, it won’t need to be painted nearly as often as wood siding. Fiber cement is also resistant to extreme heat and cold, UV rays, insects, mold, and mildew. To get this much resilience from other siding products often requires the use of multiple, sometimes toxic, finishing products. It’ll accumulate dirt like anything else. When it needs cleaning, spraying with a simple high-pressure garden hose nozzle usually does the trick. Whether you like the look of lap siding, shingles, wood shake or other siding styles, chances are very good that you can find the exact style you are looking for in fiber cement siding. James Hardie Siding comes in a wide variety of siding and trim styles. Fiber cement siding gives you the option to choose from woodgrain or smooth finishes, a feature you won’t find in most other types of siding. Modern, mid-century, craftsman or colonial, there is a fiber cement siding option for your home. Whether you want to achieve a contemporary, rustic or traditional style for your home, you can’t go wrong with fiber cement. Want to completely change the look of your home? Fiber cement is definitely the right choice. Whether you are building a new home or re-siding your current home, give us a call at Golden West Exteriors in Edmonton. We’ll help you choose the best option for your home. We’ll install it professionally. We’ll stand behind our work. And we’ll look forward to being of service again down the road.